We provide every service possible to ensure your travel and your treatment are as easy as possible. We assist with finding the lowest possible flights according to your travel dates. Some of our patients are already travelling to Bodrum and then choose to combine their holiday with dental treatment while others travel specifically for dental treatment and have the opportunity to spend some time to enjoy the local area when they are not in the dental clinic. 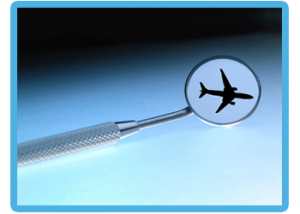 If you have already planned your holiday please let us know your arrival and departure date and we will schedule your dental appointments as per your plans. For every dental appointment we will collect you from your hotel and take you to the dental clinic. Following your dental appointment we will return you to your hotel. This service is free of charge and available for every appointment. We can assist with finding low cost flights from your local airport to Bodrum airport. www.flythomascook.com is a great place to start looking for low cost, direct flights. We can also search on your behalf and email you with the details. There are no charges or commissions for this service. The company are very reliable and you will see the driver waiting at arrivals holding a board with your name on. Bodrum has airport at Milas which city is just 20-30 minutes to Bodrum. We work with Okaliptüs Hotel which is located in Bitez which is a part of Bodrum seaside. It is very quaint with cobbled streets which lead to nice restaurants and beaches. There are lots of restaurants and it is a beautiful place to walk around when you are not in the dental clinic. It is only 5 minute car ride to the dental clinic . We have an agreement with the hotel for our patients. İf you let us know to stay the hotel you will have %10 discount from the normal price. Or you can click the below to have the %10 discount as Dent Halikarnas Dental Clinic’s patient.